Our 14th disc and final new release of 2014 is here. Introducing the Dynamic Discs Freedom. 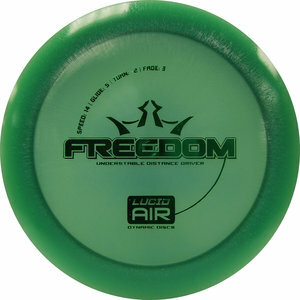 The Freedom is a 14 speed understable disc in the vein of the King or Havoc and the fastest that Dynamic Discs has ever produced. For the big arm throwers, this disc will go a long way on an anhyzer line with a predictable fade back to stable at the end giving easy distance on hyzer flip shots. For those with lower arm speeds, the Freedom is the long distance driver that you have been wanting and asking us to produce. This disc will sail past that spot in the fairway where you normally land. It will take your usual throw and translate it into uncommon distances. Free your shackled expectations of the distances that you can achieve!